Boasting a salt-water rooftop pool and bar, Akara Hotel is situated in Bangkok. Guests can enjoy city views of their rooms and access to free WiFi throughout their entire stay. The on-site staff also welcomes guests to ensure a relaxing stay in the city, 24 hours daily. All rooms at Akara are elegantly furnished with white wood and marble decor. Amenities include air conditioning, a seating area and a minibar. 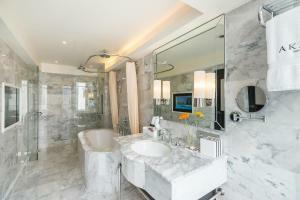 The private bathrooms are fitted with a bath or shower and complimentary toiletries. Guests can enjoy a good workout at the well-equipped fitness centre and the spacious rooftop pool. For cultural activities, Thai cooking classes are also offered. Buffet and à la carte breakfast options are available each morning at the accommodation. At Akara Hotel you will find a restaurant serving international cuisine. Vegetarian and Halal options can also be requested. The hotel is located just a 3-minute walk from Ratchaprarop Airport Link Station which connects guests directly to Suvarnabhumi Airport within a 30-minute ride. Free shuttles via Tuk Tuk can also be arranged upon request from the hotel to Phaya Thai BTS and Airport Link stations as well as the nearby King Power Rangnam. 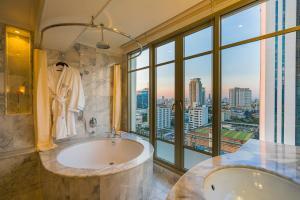 Popular points of interest near Akara Hotel include Central World Plaza, Siam Paragon and Erawan Shrine. The nearest airport is Don Mueang International Airport, 19 km from the accommodation. The property offers complimentary Club Lounge access every day from 14:00-17:00. This double room has a electric kettle, executive lounge access and minibar. 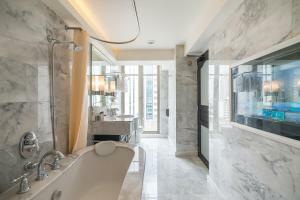 This double room features a bathrobe, tile/marble floor and air conditioning. Please note that extra bed options are not available for this room type. Rate: THB 4650.75 ... THB 11485.00; select dates below to get current rates. This suite has air conditioning, dining area and electric kettle. Rate: THB 6563.20 ... THB 11040.00; select dates below to get current rates. This twin room has a bathrobe, air conditioning and executive lounge access. Rate: THB 5616.33 ... THB 11540.60; select dates below to get current rates. This twin room features a electric kettle, view and soundproofing. Rate: THB 4385.25 ... THB 11421.40; select dates below to get current rates.